Some people are born with the kind of raw talent that makes you take your breath away. Mission Viejo artist Gabriela Moreno is such a person. Born and raised in a family of 12 in Guadalajara, Mexico, Gabriela began painting when she was six. By the time she reached 17 and had mastered many art techniques, she knew her path in life would be to teach art. 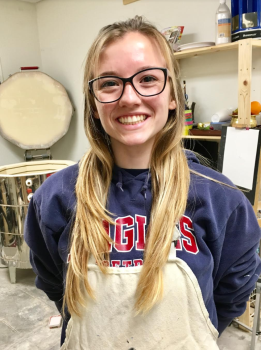 Her dream was realized in 2002 when she opened ARTime Studio, an art studio that helps students of all ages learn art skills in acrylic, water color, sketching, chalk, charcoal, cartooning, and wheel-thrown ceramics. Her business became so successful that in 2006, two popular Spanish-speaking TV stations interviewed her for operating the 'Best Studio of the Year'. opened ARTime Studio, an art studio that helps students of all ages learn art skills in acrylic, water color, sketching, chalk, charcoal, cartooning, and wheel-thrown ceramics.Her business became so successful that in 2006, two popular Spanish-speaking TV stations interviewed her for operating the 'Best Studio of the Year'. As a Mission Viejo resident, Gabriela has been deeply involved in this community. She's been a member of the City's Cultural Arts Committee for the past 7 years. For a decade, she has spread her talent through vivid life-size chalk creations at the City's Arts Alive Festival. Along with teaching, Gabriela has left her mark on Mission Viejo through murals like the larger-than-life book cover image duplication of author Rick Riordan's book in chalk on display at the Mission Viejo Library. Her large-scale murals decorate the walls of Evolution Swim Academy and Montanoso Recreation Center, the events in Mission Viejo, and the ceilings of the Lakeshore Academy. 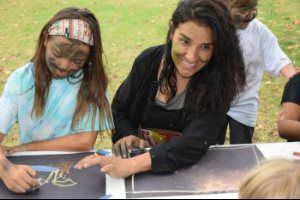 This year she has lead a couple of art classes with the city like the Power of Street Painting that gave budding young artists the chance to learn about chalk art. She continues her legacy in the heart of Mission Viejo with her second studio on La Paz and Marguerite Pkwy. Gabriela continues her love for art and teaching in this studio and hopes that all who come can find their artistic side. Hi! My name is Abby Dougherty and I am I teacher at ARTime Studio. I started doing ceramics one summer, using a plastic toy wheel and air-dry clay. After figuring out the basics in that fashion, I started attending ARTime Studio. Here I was provided with all the resources I needed in order to bring my abilities as an artist to new levels. Though I am still gaining experience as a ceramicist, I realize that every day brings a new lesson. At this studio I have not only learned the art of ceramics, but also I have learned my love for teaching. Maaria Kader was born in London, England in 1969 and moved to the United States in 1988. She now lives in Laguna Niguel, California. Maaria participates in art festivals around the country as a street chalk artist. This form of art allows her to interact with the viewers as she creates bright designs on the pavement. Growing up, Maaria experimented with various art mediums and was first exposed to scratchboard as a teenager. She recently discovered a whole new passion for scratchboard after being accepted into The International Society of Scratchboard Artists (ISSA). She has been an active member in 2016 and now holds the status of Signature Scratchboard Artist (SSA). In the 5th ISSA exhibition, Maaria received an award of excellence at The Ironwood Gallery in Tucson, Arizona. Two of her scratchboards also juried into the 2017, 6th ISSA exhibition, which was held in Adelaide, South Australia. Maaria appreciates the solitude that scratchboard affords and the time it allows for her to be creative. 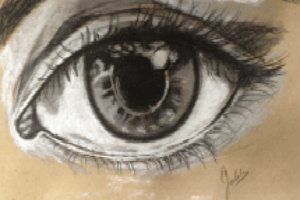 She loves the intricate details and textures that can be achieved for up-close realism. She employs the strength of her scratchboard tools and the softness of the strokes to create beautiful pieces of art. When she is not creating masterpieces, Maaria enjoys hiking, travelling, and spending time with her family. Maaria may be contacted at maariakader@gmail.com or (949) 887-8617. Miss Nicole has been a part of the studio since our start. She has become an all around teacher at the studio and manager. She has always been interested in the arts and works to expand the studio. An integral part of our Pottery program at ARTime Studio. Miss Tania is in charge of all of our pottery projects, firings, and glazings. She is a full time student and has always been interested in the arts. She has been with the studio from the very beginning.